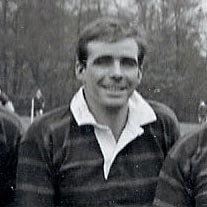 John was a stalwart of the first XVs in the mid-60s, playing well over 100 games; a fearless powerful tackler, whilst being the most gentle and civilised and decent man off the pitch. He coached the Colts in the mid-80s, was Manager in 1986/87 and was a generous sponsor of the Club for many years. John's funeral will be held on Tuesday 7th May at St John's Church, Farley Chamberlayne at 1 o'clock.